Article 1 - Department of Agriculture and Consumer Services. § 106-1: Repealed by Session Laws 1995, c. 509, s. 52. § 106-2. Department of Agriculture and Consumer Services established; Board of Agriculture, membership, terms of office, etc. § 106-3: Repealed by Session Laws 1995, c. 509, s. 54. § 106-4. Meetings of Board. § 106-5: Repealed by Session Laws 1997-74, s. 1. § 106-6: Repealed by Session Laws 1995, c. 509, s. 54. § 106-6.2. Create special revenue funds for certain agricultural centers. § 106-6.3. Create special revenue fund for research stations. §§ 106-7 through 106-8: Repealed by Session Laws 1995, c. 509, s. 54. § 106-9: Repealed by Session Laws 1997-74, s. 2. § 106-9.1: Repealed by Session Laws 1995, c. 509, s. 54. § 106-9.2. Records and reports required of persons paying fees or taxes to Commissioner or Department; examination of records; determination of amount due by Commissioner in case of noncompliance. § 106-9.3. Procedure for assessment of fees and taxes. § 106-9.4. Collection of delinquent fees and taxes. § 106-9.5. Refund of overpayment. § 106-9.6. Suits to prevent collection prohibited; payment under protest and recovery of fee or tax so paid. § 106-10. Election; term; vacancy. § 106-11. Salary of Commissioner of Agriculture. §§ 106-12 through 106-13: Repealed by Session Laws 1997-74, ss. 3, 4. § 106-14. To establish regulations for transportation of livestock. §§ 106-15 through 106-19: Repealed by Session Laws 1997-74, s. 5. § 106-20: Repealed by Session Laws 1987, c. 244, s. 1(a). § 106-21: Repealed by Session Laws 1997-74, s. 7. § 106-21.1. Feed Advisory Service; fee. § 106-21.2. Food Bank information and referral service. § 106-22. Joint duties of Commissioner and Board. § 106-22.2:	Recodified as § 143B-344.23 by Session Laws 1998-212, s. 21(a). § 106-22.3. Organic Production Program. § 106-22.4. Llamas as livestock. § 106-22.5. Agricultural tourism signs. § 106-22.6. Exercise of enforcement powers. § 106-22.7. New and emerging crops program. § 106-23. Legislative assent to Adams Act for experiment station. § 106-24. Collection and publication of information relating to agriculture; cooperation. § 106-24.1. Confidentiality of information collected and published. §§ 106-25 through 106-26.2. Repealed by Session Laws 1979, c. 288, s. 2. § 106-26.3. Declaration of policy supporting sound science in agriculture. §§ 106-26.3 through 106-26.6. Reserved for future codification purposes. Article 1A - State Farm Operations Commission. §§ 106-26.7 through 106-26.12. Repealed by Session Laws 1977, c. 1122, s. 10. Article 1B - State Farm Operations Commission. §§ 106-26.13 through 106-26.21: Repealed by Session Laws 1989, c. 500, s. 107(a). Article 2 - North Carolina Fertilizer Law of 1947. §§ 106-27 through 106-50: Superseded by G.S. 106-50.1 through 106-50.22. §§ 106-50.1 through 106-50.22. Repealed by Session Laws 1977, c. 303, s. 24. §§ 106-50.23 through 106-50.27. Reserved for future codification purposes. Article 2A - North Carolina Soil Additives Act of 1977. § 106-50.29. Administration of Article. § 106-50.31. Registration of additives. § 106-50.32. Labeling of containers. § 106-50.33. When additive considered misbranded. § 106-50.34. Records and reports of registrants. § 106-50.35. Violations of Article. § 106-50.36. Inspection and sampling of additives. § 106-50.37. Stop sale, etc., orders. § 106-50.39. Refusal or revocation of registration. § 106-50.40. Rules and regulations. Article 3 - Fertilizer Laboratories. § 106-51: Repealed by Session Laws 1987, c. 244, s. 1(b). Article 4 - Insecticides and Fungicides. §§ 106-52 through 106-65: Repealed by Session Laws 1971, c. 832, s. 4. Article 4A - Insecticide, Fungicide and Rodenticide Act of 1947. §§ 106-65.1 through 106-65.12: Repealed by Session Laws 1971, c. 832, s. 4. Article 4B - Aircraft Application of Pesticides. §§ 106-65.13 through 106-65.21: Repealed by Session Laws 1971, c. 832, s. 4. Article 4C - Structural Pest Control Act. § 106-65.23. Structural Pest Control and Pesticides Division of Department of Agriculture and Consumer Services recreated; Director; powers and duties of Commissioner; Structural Pest Control Committee created; appointment; terms; powers and duties; quorum. § 106-65.25. Phases of structural pest control; prohibited acts; license required; exceptions. § 106-65.26. Qualifications for certified applicator and licensee; applicants for certified applicator's identification card and license. § 106-65.27. Examinations of applicants; fee; license not transferable. § 106-65.28. Revocation or suspension of license or identification card. § 106-65.29. Rules and regulations. § 106-65.30. Inspectors; inspections and reports of violations; designation of resident agent. § 106-65.31. Annual certified applicator card and license fee; registration of servicemen, salesmen, solicitors, and estimators; identification cards. § 106-65.32. Administrative Procedure Act applicable. § 106-65.33. Violation of Article, falsification of records, or misuse of registered pesticide a misdemeanor. § 106-65.34. Repealed by Session Laws 1967, c. 1184, s. 13. § 106-65.35. Repealed by Session Laws 1973, c. 556, s. 12. § 106-65.36. Reciprocity; intergovernmental cooperation. § 106-65.38. Disposition of fees and charges. § 106-65.40. City privilege license tax prohibited. Article 4D - North Carolina Biological Organism Act. § 106-65.45. Authority of the Board to adopt regulations. § 106-65.46. Commissioner of Agriculture to enforce Article; further authority of Board. § 106-65.47. Authority under other statutes not abrogated; memoranda of understanding. § 106-65.48. Criminal penalties; violation of law or regulations. § 106-65.49. Article not applicable in certain cases. §§ 106-65.50 through 106-65.54. Reserved for future codification purposes. Article 4E - Pest Control Compact. §§ 106-65.55 through 106-65.61: Repealed by Session Laws 2013-265, s. 12, effective July 17, 2013. §§ 106-65.62 through 106-65.66. Reserved for future codification purposes. Article 4F - Uniform Boll Weevil Eradication Act. § 106-65.68. Declaration of policy. § 106-65.70. Cooperative programs authorized. § 106-65.71. Entry of premises; eradication activities; inspections. § 106-65.74. Authority to designate elimination zones; authority to prohibit planting of cotton and to require participation in eradication program. § 106-65.75. Authority for destruction or treatment of cotton in elimination zones; when compensation payable. § 106-65.76. Authority to regulate pasturage, entry, and honeybee colonies in elimination zones and other areas. § 106-65.77. Rules and regulations. §§ 106-65.79 through 106-65.83. Reserved for future codification purposes. Article 4G - Official Cotton Growers' Organization. § 106-65.84. Findings and purpose. § 106-65.86. Certification by Board; requirements. § 106-65.90. Failure to pay assessments. § 106-65.92: Reserved for future codification purposes. § 106-65.93: Reserved for future codification purposes. § 106-65.94: Reserved for future codification purposes. § 106-65.98. Storage of used materials. § 106-65.100. Altering tags prohibited. § 106-65.103. Payment of fees; licenses. § 106-65.104. Bedding Law Account. § 106-65.105. Enforcement by the Department of Agriculture and Consumer Services. § 106-65.105A. Detention or embargo of product or item suspected of being adulterated or misbranded. § 106-65.105B. Injunctions restraining violations. § 106-65.105D. Violation a misdemeanor. § 106-65.105E. Report of minor violations in discretion of Commissioner. § 106-65.106. Exemptions for blind persons and State institutions. Article 5 - Seed Cotton and Peanuts. §§ 106-66 through 106-67: Repealed by Session Laws 1987, c. 244, s. 1(c). Article 5A - Marketing of Farmers Stock Peanuts. §§ 106-67.1 through 106-67.8: Repealed by Session Laws 1983, c. 248, s. 1. Article 6 - Cottonseed Meal. §§ 106-68 through 106-78: Repealed by Session Laws 1987, c. 244, s. 1(d). Article 7 - Pulverized Limestone and Marl. §§ 106-79 through 106-80: Repealed by Session Laws 1987, c. 244, s. 1(e). Article 8 - Sale, etc., of Agricultural Liming Material, etc. §§ 106-81 through 106-92: Repealed by Session Laws 1981, c. 284. Article 8A - Sale of Agricultural Liming Materials and Landplaster. § 106-92.1. Title of Article. § 106-92.2. Purpose of Article. § 106-92.3. Definitions of terms. § 106-92.7. Registration of brands. § 106-92.8. Tonnage fees: reporting system. § 106-92.9. Report of tonnage. § 106-92.10. Inspection, sampling, analysis. § 106-92.11. Deficiencies: refunds to consumer. § 106-92.12. "Stop sale" orders. § 106-92.13. Appeals from assessments and orders of Commissioner. § 106-92.14. Penalties for violations of this Article. § 106-92.15. Declaration of policy. § 106-92.16. Authority of Board of Agriculture to make rules and regulations. § 106-92.17. Lime and fertilizer mixtures. Article 9 - Commercial Feedingstuffs. §§ 106-93 through 106-110. Repealed by Session Laws 1973, c. 771, s. 19. Article 10 - Mixed Feed Oats. § 106-111: Repealed by Session Laws 1987, c. 244, s. 1(f). Article 11 - Stock and Poultry Tonics. §§ 106-112 through 106-119. Repealed by Session Laws 1975, c. 39. Article 12 - Food, Drugs and Cosmetics. § 106-120. Title of Article. § 106-121. Definitions and general consideration. § 106-122. Certain acts prohibited. § 106-123. Injunctions restraining violations. § 106-124. Violations made misdemeanor. § 106-125. Detention of product or article suspected of being adulterated or misbranded. § 106-126. Prosecutions of violations. § 106-127. Report of minor violations in discretion of Commissioner. § 106-128. Establishment of reasonable standards of quality by Board of Agriculture. § 106-129. Foods deemed to be adulterated. § 106-130. Foods deemed misbranded. § 106-131. Permits governing manufacture of foods subject to contamination with microorganisms. § 106-132. Additives, etc., deemed unsafe. § 106-133. Drugs deemed to be adulterated. § 106-134. Drugs deemed misbranded. § 106-134.1. Prescriptions required; label requirements; removal of certain drugs from requirements of this section. § 106-135. Regulations for sale of new drugs. § 106-136. Cosmetics deemed adulterated. § 106-137. Cosmetics deemed misbranded. § 106-139. Regulations by Board of Agriculture. § 106-139.1. Declaration of net quantity of contents. § 106-140. Further powers of Commissioner of Agriculture for enforcement of Article; report by inspector to owner of establishment. § 106-140.1. Registration of producers of prescription drugs and devices. § 106-141. Examinations and investigations. § 106-141.1. Inspections of donated food. § 106-142. Publication of reports of judgments, decrees, etc. § 106-143. Article construed supplementary. Article 12A - Wholesale Prescription Drug Distributors. § 106-145.1. Purpose and interpretation of Article. § 106-145.4. Application and fee for license. § 106-145.5. Review of application and qualifications of applicant. § 106-145.7. Storage, handling, and records of prescription drugs. § 106-145.8. Records of prescription drugs. § 106-145.9. Written procedures concerning prescription drugs and lists of responsible persons. § 106-145.10. Application of other laws. § 106-145.11. Wholesale Distributor Advisory Committee. § 106-145.12. Enforcement and implementation of Article. § 106-145.13: Repealed by Session Laws 2015-276, s. 3, effective October 20, 2015. Article 13 - Canned Dog Foods. §§ 106-146 through 106-158: Repealed by Session Laws 1973, c. 771, s. 19. Article 14 - State Inspection of Slaughterhouses. §§ 106-159 through 106-168. Repealed by Session Laws 1981, c. 284. Article 14A - Licensing and Regulation of Rendering Plants, Rendering Operations, and Waste Kitchen Grease Collection. § 106-168.4. Application for license. § 106-168.5: Repealed by Session Laws 2016-113, s. 4(a), effective July 26, 2016. § 106-168.6. Inspection; certificate of specific findings. § 106-168.7. Issuance of license. § 106-168.8. Minimum standards for conducting rendering operations. § 106-168.9. Transportation by licensee. § 106-168.10. Disposal of diseased animals. § 106-168.11. Authority of agents of licensee. § 106-168.12. Commissioner authorized to adopt rules and regulations. § 106-168.13. Effect of failure to comply. § 106-168.14. Collectors subject to certain provisions. § 106-168.14A. Collectors of waste kitchen grease subject to certain provisions. § 106-168.15. Violation a misdemeanor. Article 15 - Inspection of Meat and Meat Products by Counties and Cities. §§ 106-169 through 106-173: Repealed by Session Laws 1997-74, s. 8. Article 15A - Meat Grading Law. §§ 106-173.1 through 106-173.16. Repealed by Session Laws 1983, c. 248, s. 2. Article 16 - Bottling Plants for Soft Drinks. §§ 106-174 through 106-184.1: Repealed by Session Laws 1975, c. 614, s. 42. Article 17 - Marketing and Branding Farm Products. § 106-185. Scope of Article; federal-State cooperation. § 106-186. Power to employ agents and assistants. § 106-187. Board of Agriculture to investigate marketing of farm products. § 106-188. Promulgation of standards for receptacles, etc. § 106-189. Sale and receptacles of standardized products must conform to requirements. § 106-189.1: Repealed by Session Laws 1983, c. 248, s. 3. § 106-189.2. Sale of immature apples. § 106-190. Inspectors or graders authorized; revocation of license. § 106-190.1. Aggregate State service credit for graders. § 106-191. Appeal from classification. § 106-192. Certificate of grade prima facie evidence. § 106-193. Unwholesome products not classified; health officer notified. § 106-194. Inspection and sampling of farm products authorized. § 106-194.1. Farm Product Inspection Account. § 106-195. Rules and regulations; how prescribed. § 106-196. Violation of Article or regulations a misdemeanor. Article 18 - Shipper's Name on Receptacles. § 106-197: Repealed by Session Laws 1997-74, s. 9. Article 19 - Trademark for Standardized Farm Products. §§ 106-198 through 106-202: Repealed by Session Laws 1987, c. 244, s. 1(g). §§ 106-202.1 through 106-202.5. Reserved for future codification purposes. Article 19A - Records of Sales of Farm Products. § 106-202.6. Dated sales confirmation slips; inapplicable to consumers. §§ 106-202.7 through 106-202.11. Reserved for future codification purposes. Article 19B - Plant Protection and Conservation Act. § 106-202.13. Declaration of policy. § 106-202.14. Creation of Board; membership; terms; chairman; quorum; board actions; compensation. § 106-202.15. Powers and duties of the Board. § 106-202.16. Criteria and procedures for placing plants on protected plant lists. § 106-202.17. Creation of committee; membership; terms; chairman; meetings; committee action; quorum; compensation. § 106-202.18. Powers and duties of the Scientific Committee. § 106-202.19. Unlawful acts; penalties; enforcement. § 106-202.20. Forfeiture of illegally possessed plants; disposition of plants. § 106-202.21. Ginseng dealer permits. § 106-202.22. Denial, suspension, or revocation of permit. Article 20 - Standard Weight of Flour and Meal. §§ 106-203 through 106-209. Repealed by Session Laws 1945, c. 280, s. 2. Article 21 - Artificially Bleached Flour. §§ 106-210 through 106-219. Repealed by Session Laws 1975, c. 614, s. 42. Article 21A - Enrichment of Flour, Bread, Cornmeal and Grits. §§ 106-219.1 through 106-219.9. Repealed by Session Laws 1975, c. 614, s. 42. Article 22 - Inspection of Bakeries. §§ 106-220 through 106-232. Repealed by Session Laws 1975, c. 614, s. 42. § 106-233. Repealed by Session Laws 1975, c. 614, s. 42. § 106-234. Repealed by Session Laws 1949, c. 978, s. 2. § 106-235. Repealed by Session Laws 1963, c. 1135. §§ 106-236 through 106-238. Repealed by Session Laws 1975, c. 614, s. 42. Article 24 - Excise Tax on Certain Oleomargarines. § 106-239. Repealed by Session Laws 1975, c. 614, s. 42. Article 25 - North Carolina Egg Law. §§ 106-240 through 106-245. Repealed by Session Laws 1955, c. 213, s. 14. §§ 106-245.1 through 106-245.12. Repealed by Session Laws 1965, c. 1138, s. 3. Article 25A - North Carolina Egg Law. § 106-245.13. Short title; scope; rule of construction. § 106-245.15. Designation of grade and class on containers required; conformity with designation; exemption. § 106-245.16. Standards, grades and weight classes. § 106-245.21. Rules and regulations. § 106-245.23. Power of Commissioner. § 106-245.24. Penalties for violations; enjoining violations; venue. § 106-245.25. Warnings in lieu of criminal prosecutions. § 106-245.27. Persons punishable as principals. § 106-245.28. Act of agent as that of principal. § 106-245.29. Reserved for future codification purposes. Article 25B - Egg Promotion Tax. § 106-245.30 Legislative findings; purpose of Article. § 106-245.32. Levy of tax; rules. § 106-245.33. Report and payment of tax by handler; definition and functions of handler. § 106-245.35. Records to be kept by handler. § 106-245.36. Interest on tax; collection of delinquent tax. § 106-245.37. North Carolina Egg Fund. § 106-245.39. Effect on Article 50 of Chapter 106. Article 26 - Inspection of Ice Cream Plants, Creameries, and Cheese Factories. § 106-246: Repealed by Session Laws 2013-265, s. 13, effective July 17, 2013. § 106-247. Cleaning and sterilization of vessels and utensils. § 106-248: Repealed by Session Laws 2013-265, s. 14, effective July 17, 2013. § 106-249. Receivers of products to clean utensils before return. § 106-250. Correct tests of butterfat; tests by Board of Agriculture. § 106-251. Department of Agriculture and Consumer Services to enforce law; examinations. § 106-252. Closure of plants for violation of Article; certificate to district attorney of district. § 106-253. Standards of purity and sanitation; regulating trade or brand names of frozen or semifrozen desserts. § 106-254. Inspection fees; wholesalers; retailers and cheese factories. § 106-255. Violation of Article a misdemeanor; punishment. Article 27 - Records of Purchases of Milk Products. §§ 106-256 through 106-259: Repealed by Session Laws 1987, c. 244, s. 1(h). Article 28 - Records and Reports of Milk Distributors and Processors. § 106-261: Repealed by Session Laws 2017-10, s. 3.10, effective May 4, 2017. § 106-262. Powers of Commissioner of Agriculture. § 106-263. Distribution of milk in classification higher than that in which purchased. § 106-264. Inspections and investigations by Commissioner. § 106-265. Failure to file reports, etc., made unlawful. § 106-266. Violation made misdemeanor. Article 28A - Regulation of Milk Brought into North Carolina from other states. §§ 106-266.1 through 106-266.5: Repealed by Session Laws 1979, c. 157, s. 1. § 106-266.6. Reserved for future codification purposes. Article 28B - Regulation of Production, Distribution, etc., of Milk and Cream. § 106-266.7: Repealed by Session Laws 2004-199, s. 27(a), effective August 17, 2004. § 106-266.8: Repealed by Session Laws 2004-199, s. 27(a), effective August 17, 2004. § 106-266.9: Repealed by Session Laws 2004-199, s. 27(a), effective August 17, 2004. § 106-266.10: Repealed by Session Laws 2004-199, s. 27(a), effective August 17, 2004. § 106-266.11: Repealed by Session Laws 2004-199, s. 27(a), effective August 17, 2004. § 106-266.12: Repealed by Session Laws 2004-199, s. 27(a), effective August 17, 2004. § 106-266.13: Repealed by Session Laws 2004-199, s. 27(a), effective August 17, 2004. § 106-266.14: Repealed by Session Laws 2004-199, s. 27(a), effective August 17, 2004. § 106-266.15: Repealed by Session Laws 2004-199, s. 27(a), effective August 17, 2004. § 106-266.16: Repealed by Session Laws 2004-199, s. 27(a), effective August 17, 2004. § 106-266.17: Repealed by Session Laws 2004-199, s. 27(a), effective August 17, 2004. § 106-266.18: Repealed by Session Laws 2004-199, s. 27(a), effective August 17, 2004. § 106-266.19: Repealed by Session Laws 2004-199, s. 27(a), effective August 17, 2004. §§ 106-266.20 through 106-266.21: Repealed by Session Laws 1971, c. 779, s. 1. Article 28C - Grade "A" Milk Sanitation. § 106-266.31. Board to adopt rules. § 106-266.33. Duties of the Department. § 106-266.34. Certain other authorities of Department of Agriculture and Consumer Services not replaced. § 106-266.35. Sale or dispensing of milk. Article 29 - Inspection, Grading and Testing Milk and Dairy Products. § 106-267. Inspection, grading and testing dairy products; authority of State Board of Agriculture. § 106-267.1. License required; fee; term of license; examination required. § 106-267.2. Rules and regulations. § 106-267.3. Revocation of license; hearing. § 106-267.4. Representative average sample; misdemeanor, what deemed. § 106-267.5. Standard Babcock testing glassware; scales and weights. § 106-268. Definitions; enforcement of Article. Article 30 - Board of Crop Seed Improvement. § 106-269. Creation and purpose. § 106-271. Powers of Board. § 106-272. Cooperation of other departments with Board; rules and regulations. § 106-273. North Carolina Crop Improvement Association. § 106-274. Certification of crop seeds. § 106-275. False certification of purebred crop seeds made misdemeanor. § 106-276. Supervision of certification of crop seeds. Article 31 - North Carolina Seed Law. § 106-277.3. Label or tag requirements generally. § 106-277.4: Repealed by Session Laws 1987 (Reg. Sess., 1988), c. 1034, s. 5. § 106-277.5. Labels for agricultural seeds. § 106-277.6. Labels for vegetable seeds in containers of one pound or less. § 106-277.7. Labels for vegetable seeds in containers of more than one pound. § 106-277.8. Responsibility for presence of labels. § 106-277.11. Disclaimers, nonwarranties and limited warranties. § 106-277.13. Tolerances to be established and used in enforcement. § 106-277.15. Rules, regulations and standards. § 106-277.17. Registration and variety testing. § 106-277.18. Registration and licensing of dealers. § 106-277.19. Revocation, suspension, or refusal of license for cause; hearing; appeal. § 106-277.20. Right of entry for purposes of inspection; duty of vendors. § 106-277.21. Sampling, inspecting and testing; notice of violations. § 106-277.22. Stop-sale orders; penalty covering expenses; appeal. § 106-277.23. Notice of violations; hearings, prosecutions or warnings. § 106-277.24. Penalty for violations. § 106-277.25. Seizure and disposition of seeds violating Article. § 106-277.26. Publication of test results and other information. § 106-277.27. Cooperation with United States Department of Agriculture. § 106-277.28. License and inspection fees. § 106-277.29: Repealed by Session Laws 1998-210, s. 2. § 106-277.30. Filing complaint; investigation; referral to Seed Board. § 106-277.32. Seed Board created; membership; duties. § 106-277.33. Duties of Seed Board. § 106-277.34. Actions regarding defective seed claims; evidence. §§ 106-278 through 106-284.4. Reserved for future codification purposes. Article 31A - Seed Potato Law. §§ 106-284.5 through 106-284.13: Repealed by Session Laws 1973, c. 294. Article 31B - Vegetable Plant Law. § 106-284.15. Purpose of Article. § 106-284.17. Unlawful to sell plants not up to standard and not appropriately tagged or labeled. § 106-284.18. Rules and regulations. § 106-284.19. Inspection; interference with inspectors; "stop-sale" notice. § 106-284.20. Interference with Commissioner, etc., or other violation a misdemeanor; penalties. § 106-284.21. Authority to permit sale of substandard plants. § 106-284.22. When Article not applicable. § 106-284.23. Not set out. §§ 106-284.24 through 106-284.29. Reserved for future codification purposes. Article 31C - North Carolina Commercial Feed Law of 1973. § 106-284.33. Definitions of words and terms. § 106-284.40. Inspection fees and reports. § 106-284.41. Rules and regulations. § 106-284.42. Inspection, sampling, and analysis. § 106-284.43. Detained commercial feeds. § 106-284.44. Penalties; enforcement of Article; judicial review; confidentiality of information. § 106-284.45. Cooperation with other entities. Article 32 - Linseed Oil. §§ 106-285 through 106-302. Repealed by Session Laws 1977, c. 42. Article 33 - Adulterated Turpentine. § 106-303: Repealed by Session Laws 1987, c. 244, s. 1(i). Article 34 - Animal Diseases. § 106-304. Proclamation of livestock and poultry quarantine. § 106-305. Proclamation of infected feedstuff quarantine. § 106-306. Rules to enforce quarantine. § 106-307. Violation of proclamation or rules. § 106-307.1. Serums, vaccines, etc., for control of animal diseases. § 106-307.2. Reports of infectious disease in livestock and poultry to State Veterinarian. § 106-307.3. Quarantine of infected or inoculated livestock. § 106-307.4. Quarantine of inoculated poultry. § 106-307.5. Livestock and poultry brought into State. § 106-307.6. Violation made misdemeanor. § 106-307.7. Diseased livestock running at large. § 106-308. Appropriation to combat animal and fowl diseases. § 106-309. Disposition of surplus funds. § 106-310. Burial of hogs dying natural death required. § 106-311. Hogs affected with cholera to be segregated and confined. § 106-312. Shipping hogs from cholera-infected territory. § 106-313. Price of serum to be fixed. § 106-314. Manufacture and use of serum and virus restricted. § 106-315. Written permit from State Veterinarian for sale, use or distribution of hog-cholera virus, etc. § 106-316. Counties authorized to purchase and supply serum. § 106-316.1. Purpose of §§ 106-316.1 to 106-316.5. § 106-316.2. Use of virulent hog-cholera virus prohibited without permit; virulent hog-cholera virus defined; use of modified live virus vaccines. § 106-316.3. Unlawful to import hogs inoculated with virulent virus; exceptions for immediate slaughter; health certificate and permit required. § 106-316.4. Penalties for violation of §§ 106-316.1 to 106-316.5. § 106-316.5. Repealed by Session Laws 1963, c. 1084, s. 2. § 106-317. Regulation of the transportation or importation of hogs and other livestock into State. § 106-318. Issuance of health certificates for swine and livestock; inspection. § 106-319. Burial of hogs and other livestock dying in transit. § 106-320. Repealed by Session Laws 1963, c. 1084, s. 2. § 106-321. Penalties for violation. § 106-322. Effect of §§ 106-317 to 106-322. § 106-322.1. State-federal hog-cholera cooperative agreements; establishment of hog-cholera eradication areas. § 106-322.2. Destruction of swine affected with or exposed to hog cholera; indemnity payments. § 106-322.3. When indemnity payments not to be made. § 106-323. State to pay part of value of animals killed on account of disease; purchase by State of animals exposed to certain diseases. § 106-324. Appraisal of cattle affected with Bang's disease and tuberculosis. § 106-325. Appraisal of animals affected with glanders; report. § 106-326. Report of appraisal of cattle affected with Bang's disease and tuberculosis to State Veterinarian; contents. § 106-327. Marketing of cattle affected with Bang's disease and tuberculosis. § 106-328. Report on salvage. § 106-329. Compensation when killing ordered. § 106-330. Ownership of destroyed animals; outstanding liens. § 106-331. State not to pay for feed of animals ordered killed. § 106-332. Disinfection of stockyards by owners. § 106-333. Payments made only on certain conditions. § 106-334. Owner's claim for indemnity supported by reports. § 106-335. State Veterinarian to carry out provisions of Article; how moneys paid out. § 106-336. Animals reacting to tuberculin test. § 106-337. Animals to be branded. § 106-338. Quarantine; removal or sale; sale and use of milk. § 106-339. Seller liable in civil action. § 106-340. Responsibility of owner of premises where sale is made. § 106-341. Sale of tuberculin. § 106-342. Notice to owner of suspected animals; quarantine. § 106-343. Appropriations by counties; elections. § 106-344. Petition for election if commissioners refuse cooperation; order; effect. § 106-345. Importation of cattle. § 106-346. Amount of appropriation. § 106-348. Rules and regulations. § 106-349. Violation of law a misdemeanor. § 106-350. Sale of tubercular animal a felony. § 106-351. Systematic dipping of cattle or horses. § 106-352. Counties not embraced in quarantine zones. § 106-353. Dipping vats; counties to provide; cost. § 106-354. Local State inspectors; commissioned as quarantine inspectors; salaries, etc. § 106-355. Enforcement of compliance with law. § 106-356. Owners of stock to have same dipped; supervision of dipping; dipping period. § 106-357. Service of notice. § 106-358. Cattle placed in quarantine; dipping at expense of owner. § 106-359. Expense of dipping as lien on animals; enforcement of lien. § 106-360. Duty of sheriff. § 106-361. Rules and regulations. § 106-362. Penalty for violation. § 106-363. Damaging dipping vats a felony. §§ 106-364 through 106-387: Repealed by Session Laws 1983, c. 891, s. 8. § 106-388. Animals affected with, or exposed to, brucellosis declared subject to quarantine, etc. § 106-389. Brucellosis defined; program for vaccination; sale, etc., of vaccine; cooperation with the United States Department of Agriculture. § 106-390. Blood sample testing; diseased animals to be branded and quarantined; sale; removal of identification, etc. § 106-391. Civil liability of vendors. § 106-392. Sales by nonresidents. § 106-393. Duties of State Veterinarian; quarantine of animals; required testing. § 106-394. Cooperation of county boards of commissioners. § 106-396. Authority to promulgate and enforce rules and regulations. § 106-397. Violation made misdemeanor. § 106-398. Punishment for sale of animals known to be infected, or under quarantine. § 106-399. Repealed by Session Laws 1967, c. 511. §§ 106-399.1 through 106-399.3. Reserved for future codification purposes. § 106-399.4. Imminent threat of contagious animal disease; emergency measures and procedures. § 106-400. Sale or transportation of animals affected with disease prohibited. § 106-400.1. Swine disease testing. § 106-401. State Veterinarian authorized to quarantine. § 106-401.1. Inspection and quarantine of poultry. § 106-402. Confinement and isolation of diseased animals required. § 106-402.1. Movement of animals prohibited; destruction of animals to control animal disease authorized. § 106-403. Disposition of dead domesticated animals. § 106-404. Animals affected with glanders to be killed. § 106-405. Prohibited acts; penalties. § 106-405.2. Permit for feeding garbage to swine. § 106-405.3. Application for permit. § 106-405.4. Revocation of permits. § 106-405.6. Cooking or other treatment. § 106-405.7. Inspection and investigation; maintenance of records. § 106-405.8. Enforcement of Part; rules and regulations. §§ 106-405.10 through 106-405.14. Reserved for future codification purposes. § 106-405.15. "Equine infectious anemia" defined. Article 35 - Public Livestock Markets. § 106-406. Permits from Commissioner of Agriculture for operation of public livestock markets; application therefor; hearing on application. § 106-407. Bonds required of operators; exemption of certain market operations. § 106-407.1.  North Carolina Public Livestock Market Advisory Board created; appointment; membership; duties. § 106-407.2. Revocation of permit by Board of Agriculture; restraining order for violations. § 106-408. Marketing facilities prescribed; records of purchases and sales; time of sales; notice. § 106-408.1. Market operation fees. § 106-409. Removal of cattle from market for slaughter and nonslaughter purposes; identification; permit needed. § 106-410. Removal of swine from market for slaughter and nonslaughter purposes; identification; permit needed; resale for feeding or breeding; out-of-state shipment. § 106-411. Regulation of use of livestock removed from market; swine shipped out of State. § 106-412. Admission of animals to markets; quarantine of diseased animals; sale restricted; regulation of trucks, etc. § 106-413. Sale, etc., of certain diseased animals restricted; application of Article; sales by farmers. § 106-414. Transportation, sale, etc., of diseased livestock; burden of proving health; movement to laboratory; removal of identification. § 106-415. Cost of tests, serums, etc. § 106-416. Rules and regulations. § 106-417. Violation made misdemeanor; responsibility for health, etc., of animals. § 106-418. Exemption from health provisions. Article 35A - North Carolina Livestock Prompt Pay Law. § 106-418.2. Legislative intent and purpose. § 106-418.4. Duties of Commissioner. § 106-418.5. Collection of payment. § 106-418.6. Action upon failure of payment. § 106-418.7. Authority of Board of Agriculture, North Carolina Public Livestock Market Advisory Board and the Commissioner. Article 35B - Livestock Dealer Licensing Act. § 106-418.13. Maintenance of records. Article 36 - Plant Pests. § 106-419. Plant pest defined. § 106-419.1. Plants, plant products and other objects exposed to plant pests. § 106-420. Authority of Board of Agriculture to adopt regulations. § 106-420.1. Agreements against plant pests. § 106-421. Permitting uncontrolled existence of plant pests; nuisance; method of abatement. § 106-421.1. Authority of Board of Agriculture to regulate plants. § 106-422. Agents of Board; inspection. § 106-423. Nursery inspection; nursery dealer's certificate; narcissus inspection. § 106-423.1. Criminal penalties; violation of laws or regulations. Article 37 - Cotton Grading. §§ 106-424 through 106-429. Repealed by Session Laws 1999-44, s. 3, effective May 13, 1999. Article 38 - Marketing Cotton and Other Agricultural Commodities. §§ 106-429.1 through 106-434: Repealed by Session Laws 1997-74, s. 10. § 106-435: Repealed by Session Laws 2014-100, s. 2.2(j), effective July 1, 2014. §§ 106-436 through 106-451.1: Repealed by Session Laws 1997-74, s. 11. §§ 106-451.2 through 106-451.5. Reserved for future codification purposes. Article 38A - Cotton Warehouse Act. § 106-451.8. Board of Agriculture makes rules. § 106-451.9. Commissioner of Agriculture to administer and enforce Article. § 106-451.10. Licensing of warehousemen. § 106-451.12. Action on bond by person injured. § 106-451.13. Suspension and revocation of license. § 106-451.14. License to classify, grade and weigh cotton stored. § 106-451.15. Suspension and revocation of license to classify, grade or weigh. § 106-451.16. Delivery to warehouse presumed for storage. § 106-451.17. Deposit of cotton deemed subject to Article. § 106-451.18. Receipts for cotton stored. § 106-451.19. Contents of receipts. § 106-451.20. Issuance of further receipt with original outstanding. § 106-451.21. Delivery of products stored on demand; conditions to delivery. § 106-451.22. Cancellation of receipt on delivery of cotton stored. § 106-451.23. Records; report to Commissioner; compliance with provisions of Article, rules, and regulations. § 106-451.24. Examination of books, records, etc., of warehousemen.